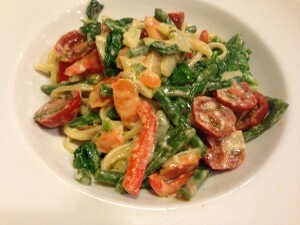 One of my favorite and easy weeknight meals is a pizza with tasty toppings. 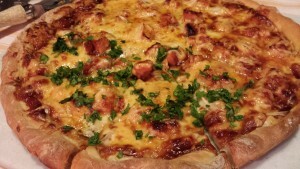 My BBQ Chicken Pizza is a take-off of the famous California Pizza Kitchen BBQ Chicken Pizza. This pizza is simple to make and you can start with either a prepared pizza dough or a flatbread. 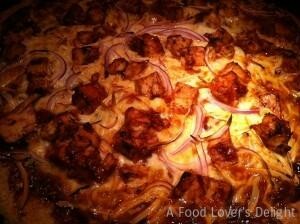 Top a prepared flatbread or pizza dough with barbecue sauce, cooked chicken chunks, shredded mozzarella and smoked Gouda cheeses, thinly sliced red onion. And bake. When the flatbread or pizza is done, let it sit a few minutes before cutting into pieces. Top with a handful of chopped cilantro or parsley. Add a BBQ chicken pizza or flatbread to your Fourth of July celebration meal! 2. 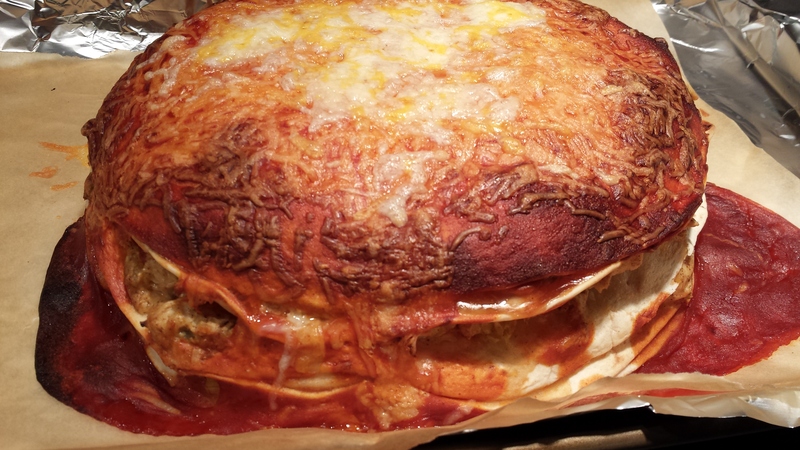 Roll out the pizza dough onto a pizza pan or place the flatbread on a baking sheet. 3. In a non-metallic bowl, toss the chicken chunks with 1/4 cup of the BBQ sauce and set aside. 4. Spread the rest of the BBQ sauce on the pizza dough or flatbreads. 5. 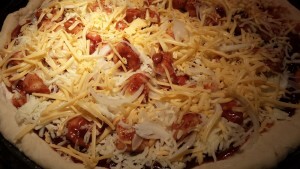 Sprinkle the shredded mozzarella evenly over the BBQ sauce. 6. Spread the chicken chunks evenly over the mozzarella cheese. 7. Sprinkle the shredded smoked Gouda over the chicken and mozzarella. 8. Sprinkle the sliced onion over the smoked Gouda. 9. 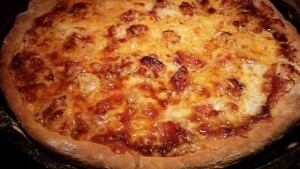 Bake the pizza for 15 – 20 minutes until the crust has browned and the cheese has melted and browned slightly. If you are using a flatbread, you may want to decrease the baking time. 10. Remove the pizza or flatbread from the oven and let it sit on the pan until the cheese sets (about 3 minutes) so you can slice it easily. 11. Sprinkle on the cilantro or parsley and serve! 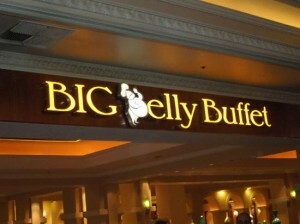 Serves 4 – 8 depending on pizza/flatbread slice size and appetite of your guests. 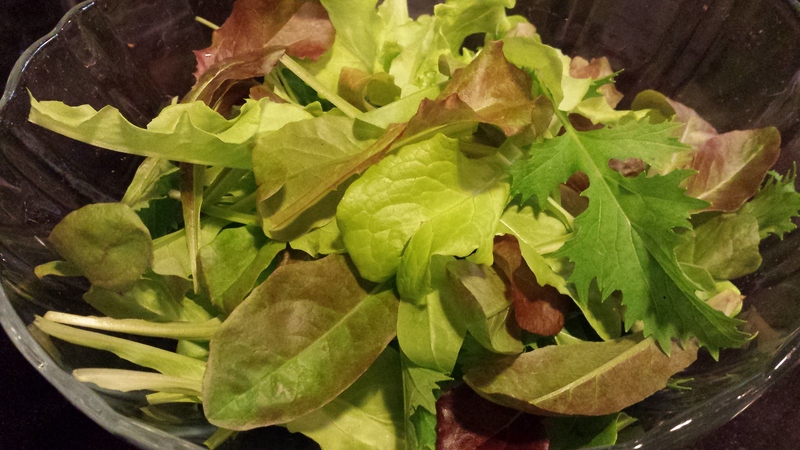 Offer with a side salad of baby greens with my Dijon Mustard Dressing. 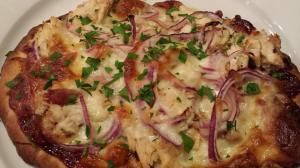 This pizza/flatbread tastes great cold, too! Variations: Omit the cilantro if you are not a fan. Use smoked cheddar cheese instead of smoked Gouda. Use cooked turkey chunks or even cooked ham chunks instead of the chicken. Try Stubb’s Bar-B-Q Sauce if you want something without too much sweetener.